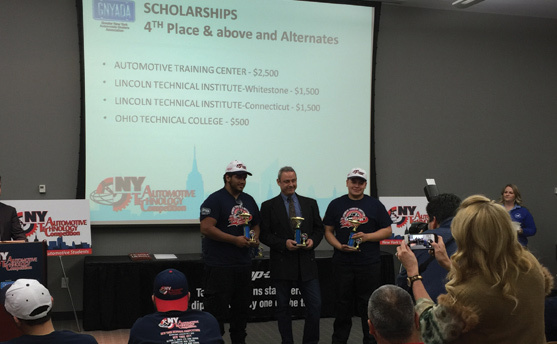 Quevin Bonilla (l) and Daniel Moreno-Bonilla (r.) of Amityville and their teacher Chris Adikes (c.) won trophies for the students’ fourth place finish at the regional competition sponsored by the Greater NY Auto Dealers Association. This win qualified them to compete at the NYS contest in February at Lincoln Tech. The automotive team attends Tech’s Dix Hills.